Silicosis is the chronic fibrosing disease of the lungs produced by the prolonged and extensive exposure to free crystalline silica dust. 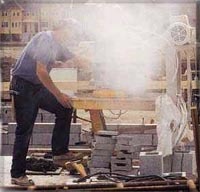 When workers inhale crystalline silica (dust), the lung tissue reacts by developing fibrotic nodules and scarring around the trapped silica particles. This fibrotic condition of the lung is called silicosis. If the nodules grow too large, breathing becomes difficult and death may result. Silicosis victims are also at high risk of developing active tuberculosis. More than one million U.S. workers are exposed to crystalline silica, and each year hundreds of these workers die from silicosis. Silicosis treatment is very limited as there is no cure for the disease, but it is 100 percent preventable if employers, workers, and health professionals work together to reduce exposures. Pneumoconiosis is the general term for lung disease caused by inhalation of mineral dust. Silicosis is a fibronodular lung disease caused by inhalation of dust containing crystalline silica (alpha-quartz or silicon dioxide), which is distributed widely, or its polymorphs (tridymite or cristobalite), which are distributed less widely.Silica-related diseases are associated only with crystalline-free silica. The most common examples of crystalline-free silica are beach or bank sands. A third form of free silica is fused silica which is produced by heating either the amorphous or crystalline forms. Other forms include cristobalite and tridymite. Workers exposed to silica dust are often exposed to asbestos as well and many will develop asbestos lung diseases including a rare lung disease called mesothelioma. If you or a loved one have been diagnosed with silicosis or you believe that due to your employment that you have been exposed to free silica dust, then call us to discuss what can be done to protect your legal rights and whether or not you have possible silicosis based lawsuit. Often our clients do not know when or where they were exposed to the silica dust. However after careful investigation and discussions with the worker about their job history, work duties and the types of products and materials that they worked with, the workers often are able to discover and understand their silica exposure history. Sometimes due to health reasons,it becomes necessary to enlist the help of former co-workers to help uncover the exposure history.All silicosis cases are handling by a contingency fee contract, which means that there will be no charges to the client for any attorneys fees or legal cases expenses unless we make a recovery for the client. NO FEES OR EXPENSES CHARGED TO CLIENT(s) UNLESS A RECOVERY OR SETTLEMENT IS OBTAINED. The statements and information provided on this website are for the informational purposes only.This site is not intended to provide legal advice to the reader and NO attorney-client relationship shall be deemed to arise from the receipt this page and/or its associated pages or any oral or e-mail communication to or from with the Willis Law Firm. There will be NO lawsuits filed, claims made, letters or phone calls made for a prospective client, until that person is represented by the firm. An attorney client relationship only arises after the attorney and client have signed a written attorney client agreement, after the attorney has evaluated the background facts provided and has accepted the representation of the client's legal action. Further, any statement or reference to past settlements or verdicts should NOT be relied upon in own case or in your decision on which law firm to hire. All client's cases, facts, injuries, damages, venues and lawsuits are different and there is NO way to predict the outcome of a particular case, verdict of a jury or judge or the strength of a case before a judge, jury or the appellate court system. The client is responsible for all of their own medical expenses. All cases are handled on a contingent fee basis. NO attorneys fees or case costs charged to client ,unless a recovery is made for the client.